Property Details: 3 Bedroom, 2 Bathroom Property with approx. 1250 square feet. 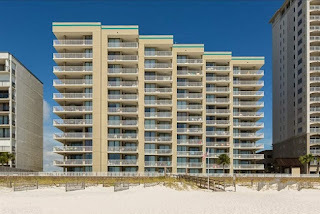 Orange Beach condo for sale at Romar Place. Gulf Front condo in Orange Beach with large, diagonal tile throughout! Granite countertops in kitchens & baths with upgraded cabinets. Quality furnishings and tastefully decorated. This is a non-rental except owners have rented to same snowbirds for 3 months every year since buying in 2003. Very little wear & tear on this turn key condo! Brand new storm shutters for added value! HVAC & waterheater replaced 5 years ago. Exterior of building recently sealed & painted. Wifi now throughout the building & included in dues. Elevators recently replaced. Seller on the board for years. Excellent association so building is well maintained. Resort amenities include indoor pool, outdoor pool, hot tub, sauna, fitness center and large beautiful beach on the Gulf of Mexico! Rental projection coming soon.